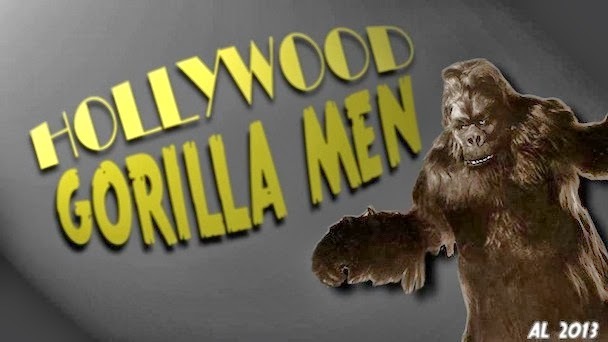 Hollywood Gorilla Men: Look out ! There's a...Gorilla at Large !!! Look out ! There's a...Gorilla at Large !!! 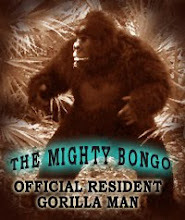 After several requests from members (thanks Mark and DonHo57) prompted a historical search of this humble blog, I came to find that one of the greats of gorilla movies had gone uncovered. 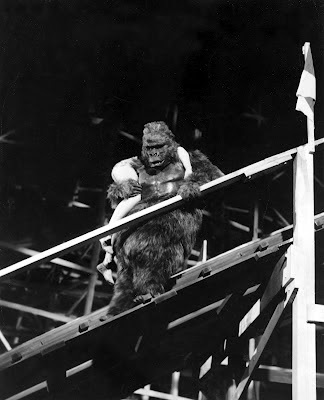 Gorilla at Large is truly an important moment in simian cinema, and in 3-D yet !!! including a VERY young, Lee Marvin as a cop who is a thorough imbecile. 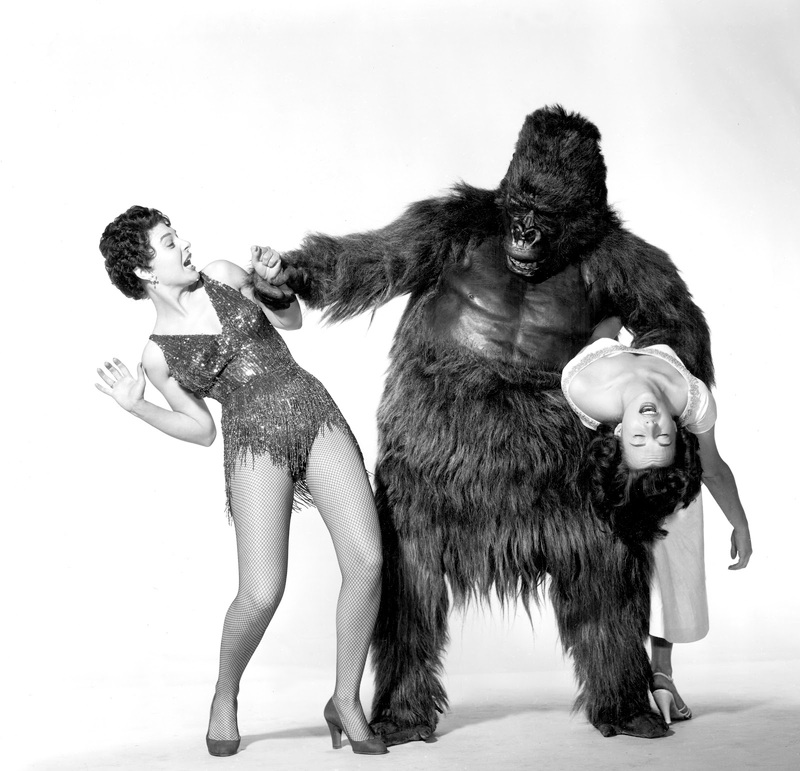 Gorilla at Large (GAL) stars Raymond Burr, Cameron Mitchell, and a scorching hot Anne Bancroft. The supporting cast features the great Lee J. Cobb, Charlotte Austin, and Warren Stevens. swinging over the enclosure of the savage gorilla Goliath ! ( George Barrows). Or so it would seem. Enter Cameron Mitchell as a carnival worker chosen to substitute for Goliath while the lights are dimmed during the show. Of note here, is the gorilla costume worn by Mitchell was a rental costume manufactured by the famous Western Costume of Hollywood. but it looked painfully pathetic next to George Barrows amazing suit ! The obvious difference in quality between the suits helps to sell the idea that the pro Gorilla Man is indeed a real ( reel) gorilla. Many times this is used to comedic effect, but here it is used for high drama. It seems that a slimy carnival worker who was blackmailing the owner ( Burr) winds up murdered in Goliaths cage. At first it appears that Goliath may have killed the blackmailer, but police investigator Lee J. Cobb isn't convinced. To further ad to the fun, Goliath escapes from his enclosure and begins rampaging through the carnival. It wouldn't be a true gorilla man classic if the beastie didn't grab up a beautiful girl and go climb something, and GAL does not disappoint ! An interesting thing to look for,( and at times fairly obvious), is the use of a light weight rubber replica of Anne Bancroft for Barrows to lug around. As a guy who wears a gorilla suit, I can tell you from experience, that being a gorilla man is brutally hard work ! My suit weighs a little over 45 lbs, but George's colossal suit weighed nearly 60 ! 100 degrees hot inside, and you can't really get adequate airflow in the mask. Now after your nearly dead from just wearing the suit, you have to act...usually with a lot of action and energy. Now to finish you off, we need you to carry a 130lb woman and climb up a roller coaster with her in your arms. 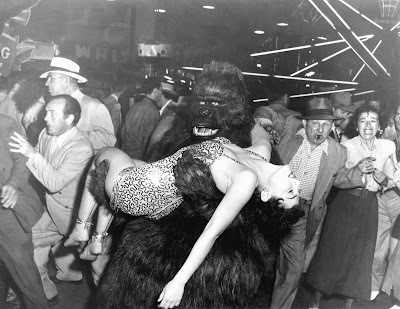 It sounds like the tortures of the damned, but it all in a days work for a gorilla man ! Back to the movie, George Barrows does carry the lovely Miss Bancroft around, as well as her rubber duplicate for the more dangerous scenes. What those scenes are, I won't tell as I don't want to spoil the fun. Needless to say, Gorilla at Large is a really fun movie with fantastic 3-D effects ! Awe come on lady...My back is killing me ! You've got lo love the effects of gravity ! Watch those paws Cameron ! 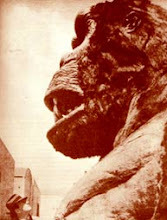 Does this big ape take care of the gorilla ? Holy crap ! Lee Marvin ! A very cool scene in 3-D !!! Beware of gorillas in submarines ! Another great shot when seen in 3-D !!! Here for you, my monkey minions, are a slew of screen caps I hand selected for you as well as some incredible promo shots from the collection of Bob Burns ! And when you get a chance , Be sure and watch Gorilla at Large ! and don't forget your 3-D glasses ! Somehow gorilla-men always end up doing the heavy lifting. Thanks! This movie is definitely on my "Too See" list. I don't want to hear any complaining. 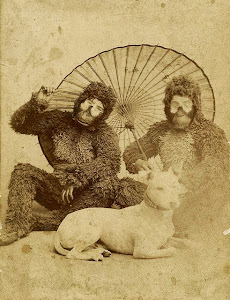 You apes knew what the job demanded when you took it. Now rip her blouse and pick that girl up and carry her around.